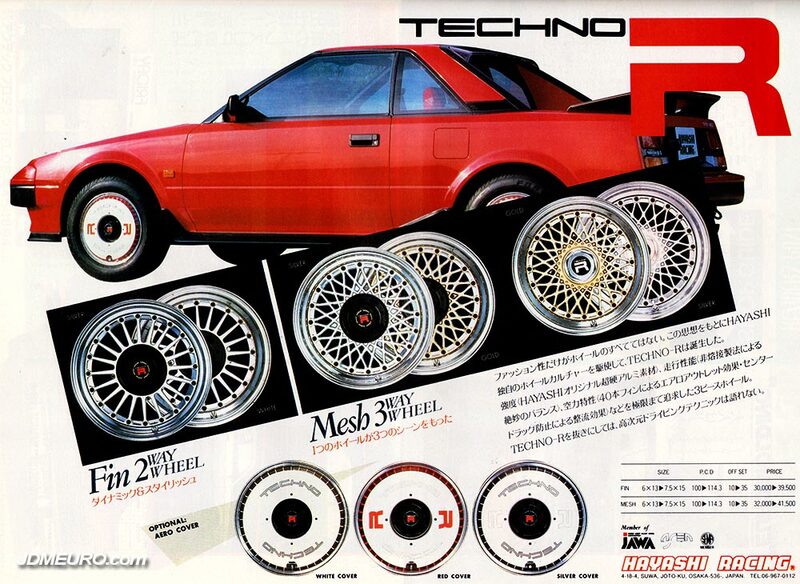 The Hayashi Racing Techno-R Fin & Hayashi Techno-R Mesh are Old School JDM Wheels which gave you options. The The Hayashi Racing Techno-R, which is based off the Hayashi Racing 502 Fin, had the 2 way option of using the plastic dust cover style cap or the the BBS Turbofan Style Optional Aero Cover. The Hayashi Techno-R Mesh, which is based off the Hayashi Racing 504 Mesh, also had the plastic dust cover style cap and the BBS Turbofan Style Optional Aero Cover; additionally a faux centerlock style hex cap and lug nut cover. Pictured are the Hayashi Racing Techno-R on a AW11 Toyota MR2.